Sheikh Mohammed Obaid al Maktoum's Sheikha Reika provided a thrilling end to the afternoon for jockey Andrea Atzeni in the E.P. Taylor, adding to his Canadian International win on Desert Encounter for a Grade 1 double on the card. The 3-year-old daughter of Shamardal, trained by Roger Varian, raced without Lasix and was sent off at odds of 6-1 having never tried group/graded company. Prominently placed early, Sheikha Reika responded to Atzeni's urgings in the stretch to hit the wire about three-quarters of a length ahead of Golden Legend, completing 1 1/4 miles over Woodbine's “good” turf in 2:05.10. Local fan favourite and Sovereign Award winner Starship Jubilee tussled with Grade 2 Dance Smartly Stakes champion Santa Monica at the start of the race, before the former assumed control in the nine-horse field. 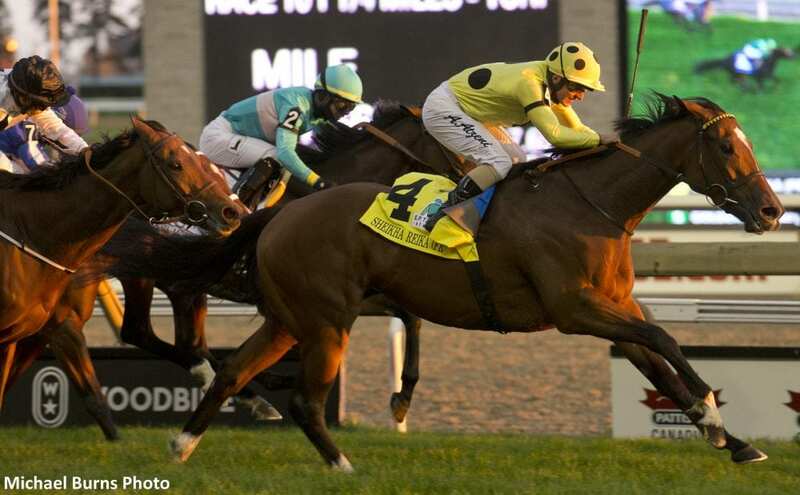 Under Luis Contreras, Starship Jubilee, Canada's 2017 Champion Turf Female, took her rivals through an opening-quarter mile in :26.77 and a half-mile timed in :52.68, with a patient Atzeni keeping Sheika Reika in perfect position in fourth spot. After three-quarters was reached in 1:17.65, Starship Jubilee and Contreras, in front by two lengths, looked to fend off all foes as the field braced for the long stretch run, while Atzeni angled out his charge in an attempt to track down the stubborn leader. Sheikha Reika wouldn't be denied, going on to post a three-quarter-length victory over another French-bred miss, Golden Legend, who also rallied stoutly. Santa Monica was third and Starship Jubilee held fourth. “It was very important for her to jump out well… it was very important for me to take a good position heading into the first corner and travel nicely,” said Atzeni, who has been aboard for all of Sheikha Reika's starts. “The pace was a bit slow, but it turned into a little bit of a sprint, that's why she sort of took her time to hit top gear, but when she hit top gear, she went on to win in the end. Sheikha Reika came into the E.P. Taylor off a splendid 4 1/2-length score in the John Musker Fillies' Stakes on September 19 at Yarmouth, a race also contested at 1 1/4-miles. The daughter of Shamardal also took Atzeni to his second straight Grade 1 score, less than an hour apart. Sent off at 6-1, Sheikha Reika returned $14.10, $8.80 and $5.30 and fronted a 4-5 exactor with Golden Legend ($9.90, $5.50) that returned $126. Santa Monica ($3.20) completed a 4-5-2 triactor worth $558.70 and Starship Jubilee completed a $1 superfecta of 4-5-2-7 that came back $1,765.60. Proctor's Ledge, Pollara, Sky Full of Stars, Elysea's World and Summer Luck rounded out the order of finish. Bred in France by Mark Johnston Racing, Ltd, Sheikha Reika was a $735,100 yearling purchase at the Tattersalls October sale. She did not break her maiden until April of this year in her fourth lifetime start, but recorded her first stakes win last out and was successful in her first top-level try this Saturday. From eight career starts, Sheikha Reika has compiled three wins and four seconds with earnings of over $350,000. This entry was posted in NL Article, Racing and tagged andrea atzeni, E. P. Taylor Stakes, e.p. taylor, mark johnston racing, roger varian, Shamardal, Sheikh Mohammed Obaid Al Maktoum, sheikha reika, Tattersalls, woodbine by Paulick Report Staff. Bookmark the permalink.